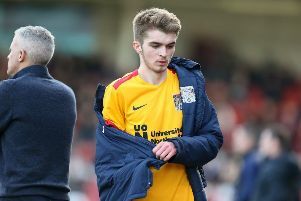 The injuries seem to be racking for at the Cobblers, but you won’t be hearing Keith Curle using them as an excuse for disappointing results or sub-standard performances. The Town boss was denied the services of Sam Foley, John-Joe O’Toole, Ash Taylor, Dean Bowditch and Morgan Roberts ahead of last weekend’s trip to Cambridge United, and then during the game he lost Shaun McWilliams and George Cox. That led to the Town midfield being anchored by two teenagers in Jay Williams and Scott Pollock for much of the game, with academy prospect Pollock making his first team debut at the Abbey Stadium at the age of 17. The pair performed well on a difficult day as Town lost 3-2 to a last minute goal, but there was no doubt the Cobblers’ preparations and plans were disrupted by the injuries. Curle though insists that is something that he and all football managers have to put up with. “Injuries are part and parcel of the game,” said the Cobblers boss. “In an ideal situation, every manager would want every single player fit every single day, for every single game, but it’s not going to happen. “On Saturday, we still gave a committed performance and on this occasion we had some younger players than came in, and I would rather take that positive and talk about how well they did. “We are going to get injuries because we are a committed bunch, and most of the injuries are from tackles, and contact injuries are very difficult to counteract. “The way that we train, the way that we play, we are not wrapped in cotton wool, we haven’t got rolls and rolls of bubble wrap. “We want players committed in training and we want players committed in matches, and sometimes we are going to get injuries and we have to deal with those. Curle is hoping that some of the walking wounded will be fit for this Saturday’s clash with fellow strugglers Morecambe at the PTS Academy Stadium. The Shrimps are currently third bottom in the Sky Bet League Two table, but are only five points behind 16th-placed Town. Midfielder Joe Powell, who was signed on loan from West Ham United on Monday, is set to make his Football League debut in Saturday’s match, which kicks off at 2pm to avoid a clash with Saints’ clash with Leicester Tigers at Franklin’s Gardens.